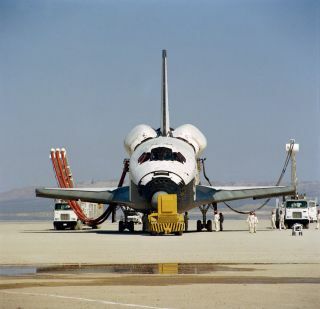 This head-on photograph of NASA's space shuttle Columbia was taken during post-landing servicing on Rogers dry lake bed at Edwards Air Force Base in southern California. The STS-1 mission ended earlier today, two and one third days later and thousands of miles removed from Sunday's Florida launch setting. Astronauts John W. Young, commander, and Robert L. Crippen, pilot, were Columbia's first crew. CAPE CANAVERAL, Fla. — The first Israeli astronaut makes this month's shuttle mission a high-profile target, NASA's security chief says, but security hasn't increased tremendously for the Jan. 16 launch. "We adjust our security posture for every launch," David Saleeba, a former Secret Service agent, said Tuesday. The latest delay for Columbia , which was supposed to launch in July, gave NASA more time to prepare for possible terrorist threats, but Saleeba said all launches have been under tighter security since the attacks of Sept. 11, 2001. "The additional time has helped us, but it hasn't been critical," Saleeba said. "There have been adjustments upward since 9/11, things that will stay in place for the foreseeable future," he said. "We've also ratcheted some things up. We've also backed off in some areas of security in the last few launches." He wouldn't reveal how many security forces were on the job, though he said NASA was working with a variety of Homeland Security agencies to ensure the safety of the shuttle. No specific threats to this scientific mission have been received, he said. The seven-member crew includes Ilan Ramon, the first Israeli astronaut. "We always have concerns about these missions because, again, the shuttle is a fairly prominent symbol of American technology," Saleeba said. Of Ramon, he said: "Obviously that's going to offer a higher profile for this particular launch, but right now, we have no direct threats against that individual or against the agency." NASA is using the resources of other agencies to monitor intelligence for security problems, he said. NASA also has considered the possibility of an attack not on Kennedy Space Center but in a neighboring community and how that might increase fears enough to stop a launch. "It's still primarily a local law enforcement issue, but we are, we are and have been for some time, cognizant of that prospect," Saleeba said. Some security measures have been under review for possible easing in the near future, he said, and more members of the public may be allowed into future launches, too. The launch will be during a 21/2-hour window sometime between 10 a.m. and 2 p.m. EST on Jan. 16. The target launch time will be announced 24 hours in advance. Published under license from FLORIDA TODAY. Copyright © 2003 FLORIDA TODAY. No portion of this material may be reproduced in any way without the written consent of FLORIDA TODAY.